What's FBI Online Agent Infection? FBI Online Agent has been around the web block a few times. This infection is also called www.removevirus.org/fbi-moneypak-2. It is the same virus and it will act pretty much the same when installed on a computer. The warnings and messages are going to pop up and just like the first version, it should be ignored. 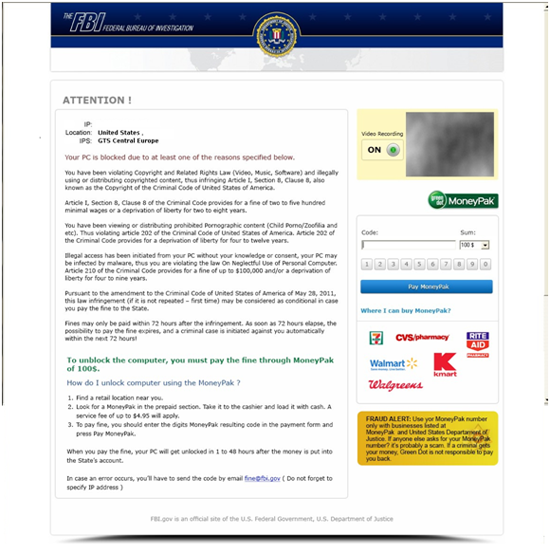 The intent is to make this scam seem so real that people will spend their money to stop this virus. However, you don't want to fall for it. Everything is a hoax. Take the proper steps to delete this infection and restore your computer. How Did FBI Online Agent Virus Get on my Computer? This virus is being transmitted in several different ways. What tends to happen with some of the infections is people think it's a software update but it really is a virus. Users can also get infected when a computer does not have the right security precautions in place. The necessities include having updated security patches for you specific OS as well as a reliable computer antivirus program to help protect you. If a user visits a website that is actually hacked with this virus without an antivirus protection program this computer can become infected. Is FBI Online Agent Damaging my Computer? People who have this virus will notice that they cannot run their programs in a regular fashion. This is what this program does to systems. You will not be able to operate your computer normally until this virus is removed from any computer it is installed on. Any other information that is stored on the computer like banking and documents are all safe and are not being stolen or sent out. One of the most alarming parts of this threat for users is the fact that pictures will be taken from any webcam that is hooked up. People begin to think the FBI is reality behind this because of the warnings. They are not real. All of them are fake. Don't be scared into spending your money. It's just a waste. To stop this virus from taking over your computer any longer you will have to find and then delete the executable. Then you can run a full system scan to double check that everything is gone. Look for the virus file name. Although it will be different on every computer you can expect it to look something like "RANDOM-Name.exe". 1. Browse to the file location and then rename the file. This is because you will not be able to delete any file that is in use. Since the virus is running, it's in use. After you rename the file, then you will have to restart your computer system. If you run into some difficulty then all you have to do is sort the files by date. You will be able to tell the virus file from all the others because it will look very out of place. 2. Boot the computer in Safe Mode with Networking or just Safe Mode. Then you should install a protective program like SpyHunter. 3. Logging in to the computer under another user account then attempting to delete the file is another way to get rid of this threat. Make sure you use the file locations to stay on track. 4. Que the Task Manager and then terminate the process as soon as you log in. Locate and delete the file. 5. The command line can be used to kill the task the command line to kill the task and then delete the file using the File Locations below.